First-time marijuana users have reported different effects when using edibles. 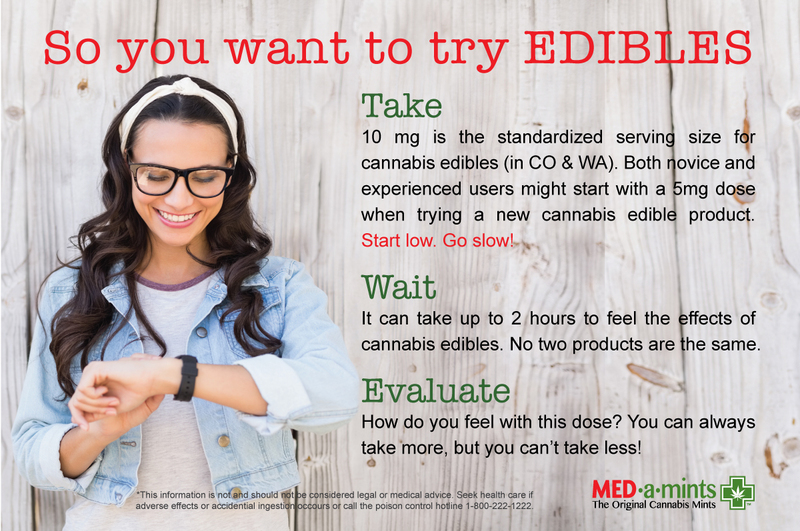 If you are planning to ingest a marijuana edible for the first-time, it is important to make an informed decision. No matter which edible cannabis product you choose, the most important thing to know is you can always eat more, but you can’t eat less. Just because something tastes good, doesn’t mean you should eat a lot of it all at once. If you eat more than you are comfortable with, your body still has to process it. Are you starting to understand why edibles education is important? Please take the time to read the edibles education cards we have prepared. Be informed. Use cannabis safely. 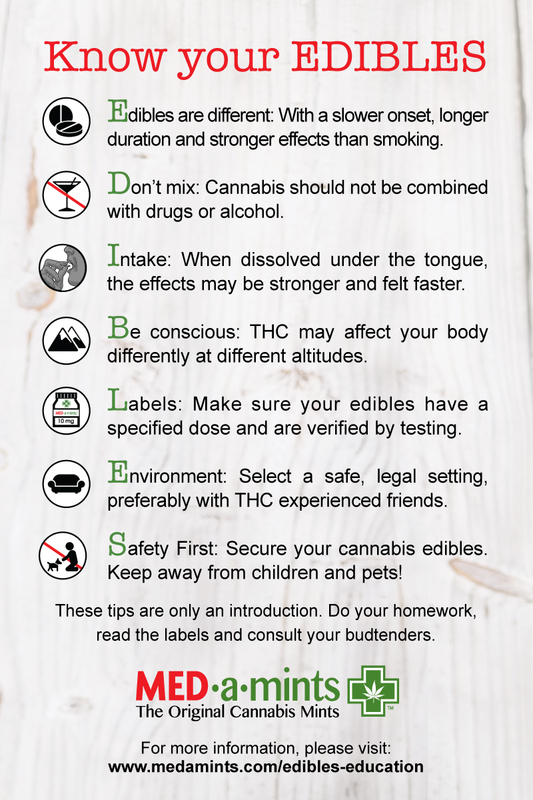 If you would like some edibles education cards to distribute at your dispensary, send us a message. Hello, I’m Hayley Witherell, from Colorado Badged Network, AgriScience Labs, and The Dab Project. Millions of people across the states will be gathering this week to celebrate a common theme. It’s 4/20, and it’s the best time to learn how to celebrate in a safe and enjoyable way. I’m joined tonight by the best-selling author of Cannabis for Chronic Pain, Dr. Rav Ivker, and co-creator of Medamints, Gary Gabrel. Before we begin, I’d prefer to hear a bit more about each of you. Dr. Rav, what’s your background? I’ve been a family physician practicing HM since 1972. For the past 7 years, in my Fully Alive Medicine practice in Boulder, I’ve worked with more than 7500 chronic pain patients, using MMJ to relieve their suffering. Whatever their chronic pain condition has been, the results have been remarkable for both pain relief and a significant reduction or total elimination of their prescription opioids, anti-inflammatories, benzos, muscle relaxants, and sleep meds. That’s incredibly interesting. And Gary, please tell me about yourself. I’m a lifelong entrepreneur and cannabis activist. Before Medamints, I was the creator of a popular board game called Pente and created a chain of restaurants in Oklahoma known as Hideaway pizza. Cannabis has been a major part of my life since my college days when I began using it and quickly got busted. I’ve used it on and off ever since to stimulate creativity, de-stress, and generally enjoy life. That’s great to hear. Dr. Rav, I know from reading your book Cannabis for Chronic Pain that you also have some very personal experience with cannabis as medicine. Would you mind sharing that? In spite of seeing thousands of success stories with patients for treating chronic pain, it wasn’t until I developed a severe case of shingles in late March of 2015, that I became a fervent believer in the healing power of cannabis medicine. The pain was like nothing I’d ever experienced, and I’ve had broken bones and acute appendicitis. On a scale of 1-10, it was consistently between an 8-10+ for the first 2 months unless I used MMJ. If I vaporized it, within a few minutes it was dramatically reduced to a 2-4. It was truly miraculous. Pain above a 5 is all-consuming and makes it extremely difficult to focus on anything other than the pain. The MMJ not only quickly relieved the pain, but I was able to function quite well, lead a relatively normal life, and even enjoy life in spite of living with some degree of chronic pain. Is that why you decided to write Cannabis for Chronic Pain? Yes, it was this painful ordeal that inspired me to write CCP, to promote cannabis as a solution to our opioid crisis, to include cannabis as an integral component in the holistic treatment of chronic pain, and to recognize that after nearly 5 decades of practicing medicine cannabis is the most powerful holistic healing herb on the planet. Today, we meet to discuss something very relevant happening this week: responsible cannabis consumption, especially the safe enjoyment of edibles. I’d also like to hear more about a technique gaining in popularity, called “microdosing”. Gary, why is it important to you to deliver this message on 4/20? 420 is basically a national holiday for cannabis, and thus a time when it is in the national spotlight. I believe we are at a turning point in history when using cannabis can become as normal as taking an aspirin or drinking a light beer. But for this to happen, a lot more people will have to try cannabis and have a good experience when they do, not an extreme one getting stoned or wasted. This presents us with the challenge of educating people on the smart and proper use of this potent drug. People need to learn to control their dosage just as they do with alcohol. Intelligent people don’t get drunk, and there’s no need to go there with cannabis either. Those are solid points. Do you believe that edible safety is taken for granted, even in Colorado? People with experience may take chances because they know cannabis isn’t toxic. Even experienced users can make mistakes combining their use of cannabis with alcohol and other drugs, and then engaging in risky behaviors. Cannabis often takes the rap for alcohol abuse. But the vast majority of Americans, maybe 90%, have not tried cannabis, and it’s easy to see them making bad choices based on a lack of information or good guidance. Good safety information and continuing education is very important for all us. Dr. Rav, what is your greatest fear of someone consuming too many servings of edibles or even just cannabis in general? Edibles have always been considered food infused with cannabis. However, due to their inconsistency, I no longer recommend them. I repeatedly hear from patients that they can eat the same size piece two days in a row, and have a very different effect. The problem is that the ingredients are not evenly distributed throughout the entire product. So you can’t really depend on them to deliver a consistent therapeutic effect, which is why most of the ER visits resulting from cannabis overdose are from edibles. My greatest concern with edible overdosing (or any cannabis overdose, but it occurs most often with edibles) is that patients will have had such an uncomfortable experience that they’ll refuse to take any cannabis product in the future. Gary, as someone in the edibles sphere yourself, what are your basic guidelines for a safe, enjoyable experience? The most basic guidelines are: Start Low and Go Slow. Low means a low dosage, like 5 or less, and slow means being very patient and giving plenty of time for the dose to be fully absorbed before consuming more. Establish a baseline dosage that feels safe and comfortable for you. For example, do a 10 mg dose several different times before graduating to 15 mg.
Also, learn about the 2 methods of ingestion— chew and swallow, or absorbed in the mouth through your cheeks and gums. This latter method allows for the medicine to absorb directly into the bloodstream for faster and more consistent experience. This is the smartest method of doing cannabis in my opinion, and definitely gives people the greatest control, value, and bang for your buck. Build familiarity with a particular cannabis form and uptake method, and your confidence will grow from there. So, Gary, your edible, Medamints, is marketed as ideal for macrodosing. Can you tell us what this is, and how it’s relevant to the 4/20 experience? Can tell us what this is and how it’s relevant to the 420 experience? Microdosing is using the smallest amount of cannabis possible to get the medicinal benefits of cannabis, and that usually can be accomplished without getting high. So to simply take the edge off, relax, or be stimulated, you don’t have to be stoned. On 420, certainly there’s a party atmosphere, but I also imagine a lot of people will be given the chance to experience cannabis for the first time. I’m afraid that the cannabis community is too quick to glorify excessive consumption. Like really big bongs and dabs. It reminds me of college campus binge drinking, and it’s not a model we want to be replicated in cannabis. So microdosing is, especially for new users, a good way to begin. I advise taking a small dose, waiting at least 2 hours to feel the effects, and then, assessing and deciding whether that’s the right dose or the person wants to do more. I am a huge fan of microdosing myself. Dr. Rav, I know that you are too. In fact, you specifically recommend it in Cannabis for Chronic Pain. Why do you find that this is such a favorable technique? Every person is unique and responds a bit differently to any medicine. When prescribing medicine, I’ve learned that a one-size-fits-all approach doesn’t work well. This is why it’s important to start low and microdose. But you need a product that you can depend on to deliver a consistent therapeutic effect. The only edible I’m aware of with which you can conveniently and reliably microdose are Medamints. These are cannabis-infused mints that can be consumed as both a sublingual tablet or as an edible. I recommend them both for their consistency and convenience. Their effect lasts for four to eight hours depending upon whether they’re dissolved in your mouth or chewed and swallowed. They’re sweetened with xylitol, and contain a combination of CO2-extracted cannabis oil along with medicinal herbs, spices, and terpenes to either relieve pain, energize, relax, or sleep. Before we conclude, I want to ask each of you for a few parting words of advice on safe cannabis consumption. What would you tell someone who has never used cannabis before? Cannabis is an extremely safe medicine. According to the National Center for Health Statistics there are NO deaths directly attributable to cannabis, and very few potential adverse side-effects, all of which are THC-related. 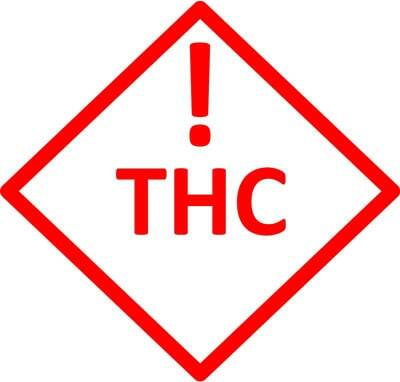 In people who are prone to anxiety, and this includes the vast majority of chronic pain patients, the high-THC products can increase anxiety and feelings of paranoia. That’s why it’s best to begin with a relatively low-dose of THC, such as 2 to 3 mg.
With chronic pain patients, there is a cycle that always exists. Pain increases anxiety which in turn causes insomnia. And with sleep deprivation there is increased anxiety which then increases pain. Cannabis breaks this cycle in three separate ways. It directly reduces physical pain, reduces anxiety, and helps with sleep. It may take several days or weeks of experimentation to determine the ideal product and dosage for you. My book, Cannabis for Chronic Pain, can help shorten this process of trial-and- error. I have chapters on 20 of the most common chronic pain conditions with the MMJ recommendations for quick relief, along with the Holistic Treatment program for long-term pain relief and a potential cure of the condition causing the pain. I can assure you that once you’ve determined the best product and dose for you, cannabis is highly effective for treating nearly any chronic pain condition, both physical and emotional pain. Thank you Haley, for the question. Let me show people this product, this is the Medamints product. We are so proud of this, my wife and friends, we’ve worked for many years developing this. And it’s so wonderful we live in an era where legalization is taking place and now they’re products of this nature that can be used with confidence, in the quality and accountability of the product, so as a first user you no longer have to worry about getting the product and medicine from the black market, and it being contaminated or the cops coming to the door and having to be paranoid like that. So we all should be appreciative of the blessing of living in this era of legalization and there’s nothing I want more for all you first users than to have a great first experience, second experience, and third experience, so you set a foundation where you can use this medicine with competence and confidence. And not worry about overdosing. You can get past that very quickly. And you reg users, let’s set a good example. Let’s be conscious that we don’t want to sustain and reinforce the reefer madness stereotypes of, you know, the irresponsible user. Cannabis is a wonderful plant, and we need to take advantage and love this plant and make sure that the freedom that we are experiencing now with legalization is sustained and expanded so that everybody in the country and the world get the chance to try this wonderful, natural medicine. Learn more about Medamints and cannabis at medamints.com Follow us on social media, ask for it. Should be available in a dispensary near you soon. I certainly hope so. Thank you. Gentlemen, thank you again so much for sitting down with me today. Medamints is an effective product that delivers a precise and consistent dose of activated THC. We recommend that first time users try one mint (if possible, without any other medicines or drugs in your system). After ingesting, it is important to wait 1-2 hours to gauge the effects before eating anymore.